‘The Essential Sangharakshita’ has just been released by Wisdom Publications. At 792 pages, it’s a substantial work, aiming to present, under a single cover, something of the breadth and depth of Sangharakshita’s writings. Included is material from 38 of Sangharakshita’s books, including his poetry, early writings, sutra commentaries, spoken word, and autobiography. There’s therefore a great range of writing styles represented, and often the same broad topic is addressed from several points of view – making for a very multi-facetted reading experience. Vidyadevi, or Karen Stout as Wisdom preferred to refer to her, is an Order Member of many years’ standing and the book’s editor. She’s been working on it for the past 5 years and has clearly lived and breathed it for much of that time – starting by re-reading all Sangharakshita’s books and marking passages for possible inclusion with little sticky notes. That produced a vast amount of material which, after first presentation to Wisdom, had to be reduced by almost half – and which still left the problem of how to organise it all! In her Preface she writes of how she tackled the problems of selection and organisation – and her masterstroke of using the Mandala of the Five Buddhas as the organising principle for the book. This allowed Vidyadevi to separate the enormous amount of material at her disposal into five great divisions, corresponding to the qualities of the five Buddhas of the Mandala. Next comes Aksobhya and a section on ‘Buddhism and the Mind’: the nature of knowledge and of the mind; the teachings of karma and conditionality, the need for clear thinking – and also some fascinating reflections on how Buddhism stands in relation to other religions and philosophies of the world. In the south, Ratnasambhava presides over a section dealing with ‘Art, Beauty, and Myth in the Buddhist Tradition’: the relationship between Buddhism and art, the aesthetic aspect of the Buddhist life, and the place of myth and symbol in the Buddhist tradition. The fourth section, in the Western direction, is where we find Amitabha and Sangharakshita’s writings on ‘Buddhism and the Heart’: the place of faith and devotion, the importance of friendship in general and spiritual friendship in particular, and the nature of the relationship between teacher and disciple. Also included here is meditation, and, somewhat arbitrarily, our relationship to the natural world. Finally, some 550 pages into the book, in the northern realm of Amoghasiddhi, we come to a lengthy final section on ‘Buddhism and the World’: Sangharakshita’s teachings on compassion and the spirit of the Bodhisattva, the ethical life, vegetarianism (and its absence in much of the Buddhist world), confession, discipline, effort, the Buddhist relationship to society as a whole, the heroic and active aspects of the Buddhist life, the Buddhist approach to world peace – and much more… It includes such treasures as his early teachings on the need to go beyond ‘Buddhist respectability’ and the dangers of confusing natural and conventional morality. One thing may puzzle the attentive reader. The book is sub-titled ‘A half-century of writings from the founder of the Friends of the Western Buddhist Order’ – but neither the Western Buddhist Order (WBO) nor the Friends of the Western Buddhist Order (FWBO) get more than a cursory mention throughout the entire work. Indeed the Western Buddhist Order is not even mentioned in the index, and the FWBO is only referred to in the introduction and in a simple blurb on the very last page, outside the text of the book itself and not written by Sangharakshita. Why might this be? Two things may help explain it – first, much of the material in the book was produced by Sangharakshita as, or even before, the WBO and FWBO were coming into existence: he was, almost literally, talking them into reality. They were therefore hardly there to be referred to when he wrote. Vidyadevi reports that she was conscious of the relative absence of the FWBO and Order while choosing her material, but had resolved to focus firmly on selecting Sangharakshita’s most relevant and best expressed writings – and simply didn’t find very much that seemed to her suitable. And second, in the same way that there is a ‘hidden pattern’, or mandala, behind the book’s structure; there is another pattern in front of it, as it were – namely the manifestation, in the real world, by real people, of Sangharakshita’s vision. It is here we will find the WBO and FWBO – we can see in them reflections of the Five-Buddha Mandala: for Vairocana, the Order, based so uncompromisingly on the centrality of Going for Refuge; for Aksobhya, ; the FWBO’s ecumenical approach and clear study syllabi; for Ratnasambhava, its emphasis on art, poetry, beauty and myth – embodied not least in places such as the London Buddhist Arts Centre or the paintings of Aloka and Chintamani; for Amitabha, the Order’s great emphasis on spiritual friendship and Kalyana mitrata, and finally, manifesting in some way the realm of Amoghasiddhi, the FWBO’s outward-going nature – its Right Livelihoods, its fundraising and work in India, its emphasis on the Four Right Efforts and regular and disciplined practice. The book ends, movingly, with a ‘double-whammy’: Sangharakshita’s reflections on ‘the miracle of spiritual development’ and his uncompromising four-point action list for any Buddhist concerned with world problems. Between its covers there is a treasure-trove of Dharma that will satisfy the reader for many hours, a heap of jewels far too many to list. Many will of course already be familiar to Sangharakshita’s students, but it will be a rare person who does not discover something new. If you are familiar with ‘Sangharakshita I and Sangharakshita II’, his teachings on beauty may be new; if you are familiar with the distinction between ‘religion-as revelation’ and ‘religion-as-discovery’ then the four levels of Perfect Speech may be new – and so on. Asked if she had any regrets now that the book is complete, Vidyadevi says it’d be that she didn’t manage to include anything from ‘Ambedkar and Buddhism’, reportedly Sangharakshita’s own favourite among his many books. And asked what she had learned from her labours, she says how struck she was by the way Sangharakshita always seemed to refer his teachings back to the Pali Canon, that most ancient of all Buddhist texts. For some, ‘The Essential Sangharakshita’ will suffice, and may even be the only book of his they ever need. 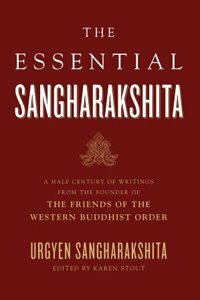 Certainly it is a more-than-adequate introduction to Sangharakshita’s thought and teaching – if not to the Friends of the Western Buddhist Order itself. For others, it will be a gateway, a taster, to the 38 works from which it is drawn, even to those not represented, and they will be led through it deeper into Sangharakshita’s thought – and perhaps into the spiritual community he has founded and nurtured for he past 40 years. ‘The Essential Sangharakshita’, ISBN 0-86171-585-3, is available from Windhorse Publications (www.windhorsepublications.com) in the UK, Wisdom Publications (www.wisdompubs.org) in the US, and Windhorse Books (www.windhorse.com.au) in Australia and New Zealand . For other countries please contact your nearest bookstore.